Magherafelt man Paul Jordan won the Supersport race at Armoy in July. Paul Jordan says he is under no pressure to deliver results on the Dafabet Devitt Kawasaki at the MCE Ulster Grand Prix. The Magherafelt man was offered the chance to ride a ZX-10R Superstock machine alongside Dominic Herbertson for the team at Dundrod with the blessing of injured racer Ivan Lintin’s family. Ivan Lintin on the Dafabet Devitt Kawasaki at the Southern 100. The Lincolnshire rider is recovering in hospital after he was caught up in the crash that claimed the life of McAdoo Racing’s James Cowton at the Southern 100 last month. 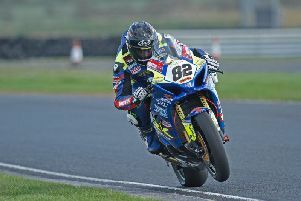 Jordan, who only had his own 600 Yamaha to ride at Dundrod, jumped at the opportunity, with the Kawasaki ride giving him the chance to compete in the Superstock race and both Superbike events on Saturday in addition to the two Supersport races. Jordan will also compete in the Superbike and Supersport races on Thursday. Jordan said: “I got the call from Dafabet Devitt Racing to see if I wanted the chance to ride their Kawasaki Superstock bike at the Ulster Grand Prix. “Wednesday will be my first time out on the bike in practice but it’s one of those things. I’ve never really had the chance to show my full potential on a big bike because I haven’t had the opportunity to ride one week in, week out. “It takes time to get adapted and once you are up to speed, then the week is nearly over, but we’ll do the best we can. They have told me there’s no pressure in terms of results and realistically my main aim is the 600 class on my own Yamaha,” he added. Jordan, who won the sole Supersport race at Armoy last month after a thrilling battle on the final lap with fellow Northern Ireland rider Adam McLean, says he faces an uphill battle on his 600 Yamaha at Dundrod. “I made enquiries about buying an engine for my 600 for the Ulster Grand Prix but the price they were asking was worth more than my whole bike! “We’ll be losing out a bit, especially on the run up towards Joey’s Windmill,” he admitted. Jordan is offering fans the chance to have their name featured on the fairing of his Yamaha at the Ulster Grand Prix to help fund his racing costs. The charge is £20 and can be paid via PayPal to garyjordan1988@hotmail.com. Everyone making a contribution will be entered into a draw to win a Paul Jordan Racing jacket and two admission wristbands to the Ulster Grand Prix on Saturday.